Deb's Cup of Tea: I am going to try this. One of the news feeds on Yahoo this morning talked about this cake. This is the famous Red Velvet Cake. I know this from my youth. One of my aunt's on my dad's side used to make it for family picnics. She made it in a 9 x 13 pan which would cause purists to gag. But it was easier to eat while sitting on the swing set at the park. I can't remember her name. I can see her face but her name eludes me. Anyway, the author of the article states that while this cake was probably invented at the Waldorf Astoria in New York City, it was adopted and perfected by "the South". 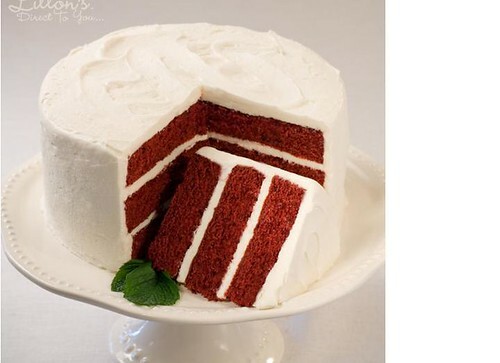 The author stated that a friend of hers said there are 8 rules for making the perfect Red Velvet Cake. 5. You must use high-quality ingredients, including White Lily flour, a Southern specialty flour. 7. You must use a hand-held electric mixer, not a stand mixer: Larger machines can over-mix the batter, which sometimes prevents the cake from rising properly. 8. Red velvet cake batter needs vegetable oil, not butter or shortening. Oil yields a very moist cake. She went on to print a recipe. After reading this, of course I'm going to have to try it. Garnish with chopped pecans, fresh raspberry or strawberry, or sprinkles. I like that these are cupcakes which I can bring to the office. Yes, there will be photographs.